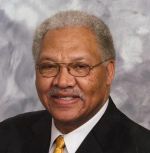 Robert Moore, a retired United States Marshal is a graduate of the University of Illinois at Springfield, with a Master Degree in Public Administration. He grew up near Pontotoc, Mississippi on a forty acre farm. Moore was nominated from the position of U.S. Marshal by Illinois Senator Carol Mosley Braun and subsequently appointed by President Bill Clinton in 1994. He served in that capacity until 2002. In 2002 he was appointed Chief of Police of Jackson, Mississippi by that city’s mayor, Harvey Johnson. Moore is also an accomplished writer. Since 1976, Moore has published numerous articles in various police magazines. Among the articles are “Strategies for Increasing Black Police Executives, “Chief Moore Journal to Vietnam and Cambodia,” “Marshal Service get Record Number of Black Marshals,” “History of the minority offices in the Illinois state police,” and “Solving the crises of Young Black Males.” His All the President’s Men is his first book. It seeks to honor and preserve the rich history of black marshals, fill the information void about their history, and educate the nation about their accomplishments. Moore is an inspiring motivational speaker, historian, and curator of the National Black Marshal traveling exhibit.